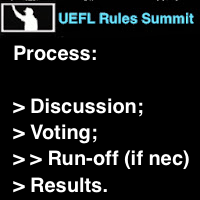 Voting is now open for the 2018 UEFL Rules Summit. Visit the Discussion thread for a detailed look at the various proposals and items up for consideration in this year's ballot. Each measure up for vote is listed in the following ballot, including descriptions. Upon Commissioner approval, all proposals receiving a majority of votes, or a plurality where appropriate pursuant to Rule 8-3, will become rules for the 2019 UEFL season. Each at-large Appeals Board member receiving a majority of votes cast in the affirmative shall be re-elected to next year's UEFL Appeals Board. The Rules Summit ballot will close Wednesday, November 21, at 11:59 pm PT. A run-off ballot and/or election, if necessary, will follow. The 2018 Rule Summit includes 11 Rules proposals, and five Appeals Board retention polls. You may vote in as many or as few polls as you wish, but only may submit one ballot. We will review voting records to determine ballot authenticity and adjust the record appropriately to account for suspicious or fraudulent activity or conduct, pursuant to the framework and procedure delineated by UEFL Rule 4-4-j. Click "read more" to access the ballot.